Three items for you today. First, David Arment returns with a little slice of life from Amish Indiana. Drivers in cold-weather climates use winter tires to get a better grip in snowy and icy conditions. Going by David’s account today, there must not be anything like that for Amish buggy horses (winter shoes? ), which led to a small challenge for one family. 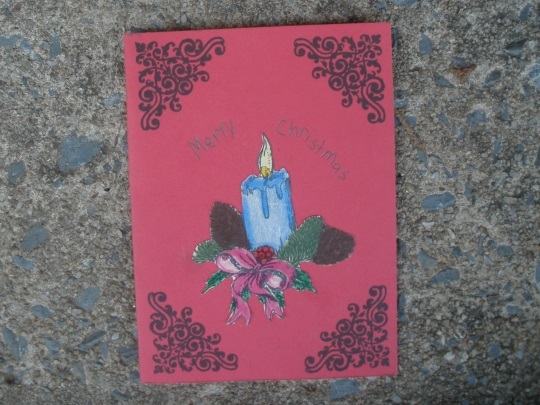 Then, reader Jerry shares a look at some hand-made Christmas cards he picked up at an Amish place in Pennsylvania. Finally, a few words on a new resource coming soon to this site. The other night it rained here in Shipshewana, Indiana. It was one of those rains that couldn’t decide. Did it want to be rain, sleet, spit half-frozen ice particles, snow, or create some new heretofore unknown form of slush to fall from the sky? Few people cared about the weather’s indecision because we didn’t need to go anywhere as we were in the middle of the long Thanksgiving holiday. As dusk turned into night the weather decided to become snow so the next morning we had snow on top of ice. The roads were not touched. Maybe it was because there was just a tiny bit of snow and not worth the bother or maybe it was because it was a holiday and the local governments were giving employees time off. Whatever the case the roads were untouched. As I went home late one afternoon at the top of our hill was an Amish buggy. It was not moving. It was immediately and abundantly clear there was a problem. The horse was in distress because he was stumbling on the ice. His hooves could not get a grip. He almost went completely down. As I was already onto a portion of the downward slope of the hill my concerns were to get around the buggy without adding to the horse’s already agitated state of mind or, worse yet, sliding on the ice into either him, the buggy, or both. I never once thought about my camera which is always in the seat next to me ready to take a picture of something exciting. About the same time I was going by the buggy I saw the Amish man exit the buggy. I turned around at the bottom of the hill trying to figure out if I could help. In the time it took me to turn around everyone had gotten out of the buggy. There were five or six little heads and a couple of medium-sized people walking up on the bank of the road. They had all apparently exited the buggy to make it lighter and easier for the horse to pull. Dad had the reins and had walked the buggy over into the ditch where the snow was and the ice was not. I don’t know if you have noticed and maybe it is different from one locale to the next, but here the buggies have a step to help you into the buggy. It is a nice step put in a logical place – at least in theory. In practice however the step is right in the middle of two wheels. When the buggy is at rest none of that makes any difference, but often Amish are climbing into a moving buggy. And if you miss the step your foot is in moving spindled wheels. This step came to my mind as I wondered about the safety of these folks climbing back into a buggy on an icy hill that was obviously not going to stop once it got going again. Once the horse got on top of the hill everyone had to get back in. The buggy was moving. One by one, little folks were helped through the door, until everyone but dad was in. He was a big guy and I was hoping he would hit the step and that it was not icy. Somehow he made it into and through the door and they were on their way again. I suppose “mom” never left the buggy and had her hands on the reins the whole time. Had I not been concerned about everyone’s health and welfare it may have occurred to me to take a picture, but then I would have been worried about inadvertently getting a face in the picture. As it was, my thoughts of photography only surfaced as they continued their way down the road and I turned my old Ford van around to go home. The picture above has no connection to the story above other than it was taken in the same general vicinity on a winter’s day. 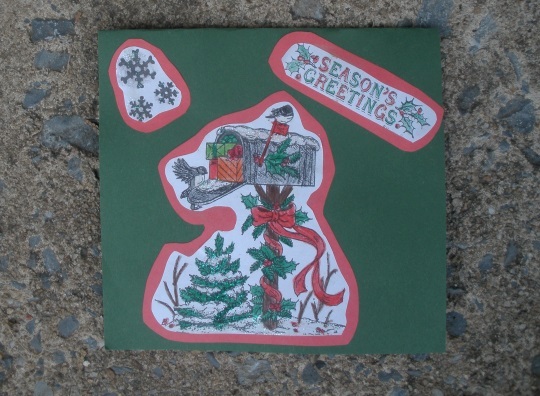 Have you mailed your Christmas cards yet? Since today’s calendar reads December 30, that might sound like a funny question, but for the past few years I’ve been cementing a new tradition of mailing them out late. I guess I can pretend I do it on purpose, to give recipients a surprise right when they think the holiday season is over (a nice story that I’m sticking with 😉 ). I found my cards for this year while out on a Saturday drive in early October. 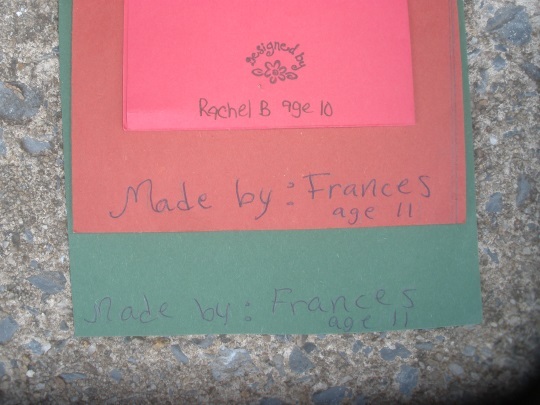 An Amish farm was holding a “yard sale” in their greenhouse and these cards were next to the bake sale table. They were three for a dollar so I bought 30. I have these three left. Almost everyone who received one wanted to know the story. I had to buy envelopes but I found a deal for 10 for $1.00 at Goodwill and they had all I needed. I think I’ll do it again next year. 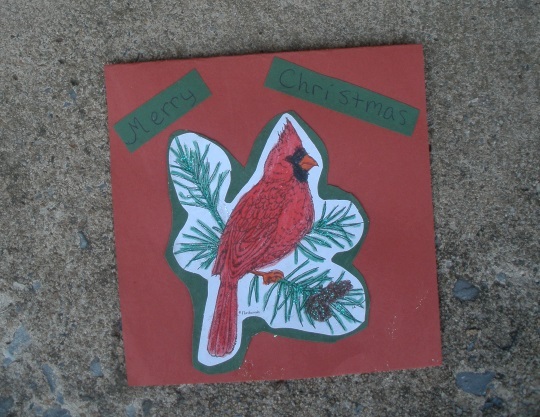 There’s something special about hand-made, and of course, where else can you get a card for 33 1/3 cents? As a side project these last few weeks I’ve been working on an FAQ page on Amish topics for this site. I realized there are a lot of basic questions that people, often newer visitors, have about the Amish – on beliefs, customs, history, clothing, technology, communities, etc. So I thought it would make sense to have a nice long list of common questions, with 2-5 sentence (max) answers, and where appropriate a link to further info. I first spent a couple of days brainstorming a rather long list of questions (over 300) in about 40 different categories. I didn’t expect to come up with so many, but it’s funny how the list grows and grows when you get into it. What songs do Amish sing? Do Amish live in closed colonies or villages? How big are Amish families? Do Amish go to high school? Can Amish use electricity when traveling (away from home)? I realize that the “F” in FAQ stands for “Frequently”, and there’s a risk that at some point the questions could get a tad obscure. However, I was surprised at how many reasonable questions I came across as put myself into the shoes of a person who doesn’t know much about Amish people and beliefs. Can you think of any questions that should be included? Your suggestions are certainly welcome. I plan to have this done and available here within the next month. I have an Amish friend that is confined to a wheel chair since a young boy and has never married. He has a beard like a married man and was wondering what is the protocol concerning the beard for Amish men. Also, I have seen an Amish woman wearing a gold band on her finger. Thought that was strange. Both of these people are from an Amish community in or near Holmes county. I realize every community has there own set of rules but generally speaking what are your thoughts? That golden band was most likely a shiny copper ring some Amish wear to ward off aches and pains. The single man with a beard, that varies with each different group of Amish. Oops! Sorry, Katie! We must have been writing at about the same time. The “gold band” is likely a copper ring that some of the low Amish wear believing it helps ward off arthritis or rheumatism pain. We see it a lot in our area among the Swartzentruber & Troyer Amish. Beard wearing varies a lot in different groups. There are groups that do not shave the beard before either baptism or marriage. For example, the “Nebraska” Amish boys grow a full beard as soon as they naturally start to grow face hair, so a beard won’t tell you anything about his position in life. In some groups a beard is worn after starting baptism classes or upon baptism, in others after marriage. In our community once a “boy” (by which we mean any male not married be he 18 or 38) no longer goes with the youth but sits with the married men (often in the forties) he will grow a regular beard but instead of having the beard grow up to the head-hair or side-burn, he will keep a small gap between beard & hair shaved. A copper ring against arthritis and rheumatism pain? To me it sounds more like something I’d use to get pains. I wonder how they got the idea? If it is very far, of course I could not go get them. I know the answer to these but you might get questions from some that don’t know. Do Amish pay taxes, and if so, which ones? 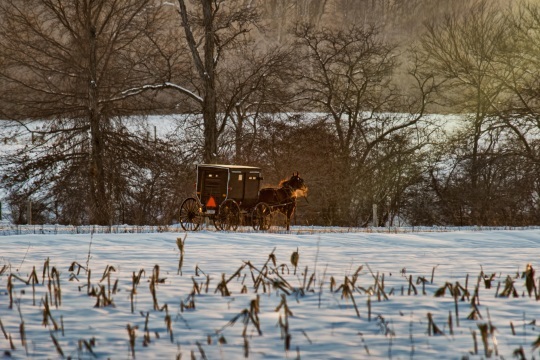 What are the holidays that the Amish observe? Thanks Tom. A couple of good ones. You will notice that the one of the right has three ‘traction point’ welds on it. As to whether this would be something they would use on icy roads, I don’t remember what all the Amish man told us. But it does look like it would be a help in those kinds of slick situations. Thank you Don. I refrained from definitively writing that they don’t have anything akin to a “snow tire”, since my horse knowledge is quite low. In fact I wouldn’t be surprised if there was something like that. That was an interesting photo you shared comparing with the two different shoes. Looks like the one might in fact provide more grip. We had similar weather in central Pennsylvania over Thanksgiving–nasty for traveling. The post reminded me of having to move our horses to a different field after a similar storm because their normal paddock was covered with ice. Once they realized it was slick under their feet they didn’t attempt to move, thank goodness, but stood in one spot until rescued! Smart beasts! And sounds like they had the faith they would be rescued. The word is ‘reins’, reigns, unless you are referring to kingdoms, you know. But in buggy talk wherever I have lived, they are not reins at all- reins are what you use when you are riding a horse. In a buggy or wagon, they are ‘lines’. Good catch Elva. I picked the nit up above. Left it as “reins” though for this post. Why don’t Amish women ever cut their hair (or do they?)? When do Amish women wear their Kapps, and what kind/color are appropriate for which “occasion”? I figured there’d be “winter” horseshoes…I love learning about these various adaptations! Happy New Year to all, and please be safe walking, driving…really, attempting ANY form of outdoor “locomotion”, especially on New Year’s Eve. There’s a great potential for lots of tipsy people out there, so let’s all be careful! Galen touched on the uncut hair idea. Read 1 Corinthians 11 for more insight, especially verse 15. White & black caps vary somewhat. In some communities only black caps are worn (like Adams Co., Ind.) and in some only white (some of the Lancaster Co. churches). In most Midwest Amish communities, married women wear always white caps. In our church, single girls wear black caps to church until they either marry or declare singlehood and sit with the married women. School age girls often wear black caps during the week just because it is easier to keep clean and less upkeep (it’s not pleated in back) but might wear white for good occasions. My wife & daughters wear a cap most of the time. For nightwear a small scarf is worn over the hair. When doing dirty or hard work, like butchering or painting or working in the garden, usually a scarf or “veil” (a small round piece of cloth held on with bobby-pins) is worn. I use the same horse shoes in winter as we do in summer. They have stuff (not sure of spelling) called drill tec on them to give the horse traction on pavement and concrete. Works well on ice too as long as there is no ice build up. Most Amish around here use it, so either they don’t use it in Indiana or there was ice build up in the shoes. I also issue snow pads and in wet snow I spray the hooves with white lithium grease. We have had no accidents yet. his beard? Is the woman looked down upon? large families? or what if the issue lies on the man’s side? Thanks for your questions Galen. I enjoyed reading your and Mark’s discussion. A divorce question at least will be included in the FAQ. Ben seems like someone I wouldn’t mind listening to in a chair on a porch somewhere. Sounds like a beautiful story. Galen, since divorce is not an option, it’s not a question we would have thought of. A widower would not shave his beard, though. I’d feel comfortable saying once the beard is grown, it’s there to stay. Or I’ve never heard anything else, anyhow. There are childless couples and no one would think of asking where the issue lies. Some adopt, some remain childless, some struggle, some accept it. We are very close friends with a childless couple who give so much to the community and seem like “family” to everyone. She once remarked she feels she has “lots of children.” On the other hand, I know of some who have really struggled to accept this. Not all of them are Amish, either. Thank you for your response. I’m only (slightly) familiar with the Lancaster Amish and I had a nice talk with “Ben” and elderly Amish gentleman who was in his mid 80’s, very witty, and he approached me as I was sitting in a gazebo. He wanted to share all these Amish jokes with me that were quite funny. I had never met an Amish gentleman that was so forward. I asked him many questions, a lot concerning what illness/cancers etc. are prevalent in their community and he said not too much cancer but mostly heart attacks and strokes. (which I am not surprised). I then asked about divorce. He said that there were some folks in his community who did divorce and the ex-wife was shunned or joined another community and the gentleman stayed part of that community. Ben was in the construction business and helped build the Bird-in-Hand Motel and Restaurant. He and his wife would sit on their porch and rock in their chairs for hours. I often wonder if they are still alive. Another good thing to mention is that Ben had left the Amish community and came back in his 30’s and married the love of his life. When he shared his beautiful story, he cried. The whole gazebo experience is one I’ll always remember and cherish. Galen, let me clarify… Divorce is not allowed, but there are cases where one partner has left the Amish and filed for divorce, but in no case I have ever heard of was the “left spouse” excommunicated, though the one leaving would be. The left one would not remarry as long as the spouse was living. I can think of at least three cases in this community where a husband ran off. I am not saying there are not more, but that’s all I can think of. It would be interesting to hear more of Ben’s life-story. Thanks for the explanation. I could have spent hours talking with Ben as he was a true inspiration. I’m sure returning to the Amish when one is in their 30’s must have been difficult as well as adapting to the “English-ways” for those 10 or so years. I was touched by his devotion to his wife and to the Amish community. I know of a couple of cases at least where the wife has left the husband, for whatever reason, I believe separation not divorce. I don’t think we should be surprised at that, marital issues are hard and no culture is immune. That story about the family and the horse and buggy was a heart-stopper. I’m glad everyone made it back into the moving buggy! I’ve only used it on a small number of occasions, but the little foot step David references always seems to me that it would be easy to miss. Especially if your other leg is planted on ice. So would an Amish woman refuse chemo for cancer if it meant she would lose her hair in the process? No, losing hair would not be an issue, though there may be individuals who decide not to take chemo for various reasons, but I don’t recall ever hearing that hair loss was part of the decision. I personally know women who had chemo and lost their hair. A few opted to wear a wig, but one lady we know did without a wig. There is a young lady in our community who lost most of her hair when she was a girl. You’ll never guess how… in a roller-coaster mishap. All she was left with was hair at the very back of her head and some serious scarring elsewhere. She wears a wig, too. As I think about that book, which is a wonderful resource, maybe another good question would be: What book(s) can I read to learn more about the Amish? Two good questions to include Al, thank you. There is a section on different groups where that first one or some version of it will fit well. Wow. Horses in some areas have little ice caulks put on the heels – and sometimes toes – of their shoes. Sometimes a pad was put over the foot, under the shoe to prevent snow and ice packing and causing injury to the hoof. I suspect that ice caulks wouldn’t be all that effective trying to pull a buggy uphill on ice, though.